April Fool’s Day is just around the corner. What will you being doing this year at the office? Of course we don’t ever want to encourage anything mean or anything that destroys property, but a little fun never hurt anyone right? Enjoy these fun ideas and tell us below what you plan on pulling off this year!! 1. “Voice Activate” your copy machine or toaster. Wonder how long it will take them to catch on? 2. Change the shortcuts on their phone. It will drive the the grammar correct person crazy! 3. Attach a sign on the downstairs bathroom that says Out of Order, use upstairs bathroom. Attach a sign on the upstairs bathroom that says Out of Order use downstairs bathroom. Watch your coworkers do the potty dance then drive off to the nearest gas station! Ha! 4. Have anyone scared of spiders? This will get ’em! 5. Switch out their telephone for a banana phone. Hello? Anyone there? 6. Install a wireless mouse to your coworker’s computer and control the mouse from your desk. Watch them be super confused! 7. When no one’s looking, sneak in the break room and add google eyes to everything in the fridge! This will ensure lots of laughter! 8. Maybe your HR department could use a new system for complaints? 9. Have you lost your money? We found your rubber band! Ha! 10. Start early and plant a garden – in the keyboard! Perfect for those coworkers who think it’s fun to go on vacation! 11. Or let’s take that a step further and grow a garden on their desk! That will teach them to go to Hawaii without you! 12. They say the throne is where you do your best thinking! Your coworker is about to become super productive! 13. Cover their mouse sensor with tape so it doesn’t work. Watch the confusion ensue! 14. And suddenly I’m craving Chinese food! Anyone for some Chinese takeout? 15. Of course somebody sometime has got to get their cubicle filled with balloons! 16. Sometimes technology isn’t all its cracked up to be. Can’t go wrong with a little cardboard! 17. Turn their cubicle into a little playhouse. This guy seems to be really enjoying this one! Haha! 18. 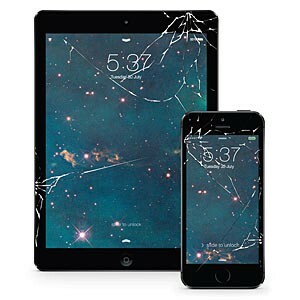 This cracked screen sticker would seriously freak my husband out! I don’t know if I even dare do this one. Too mean! 19. Sticky notes galore. You might not want to swipe these from the supply closet, however, or it might come out of your next pay check! 20. I knew saving those packing peanuts would come in handy some day! This is what our apartment looked like after coming home from our honeymoon. Not fun to clean up, but hilarious 14 years later! Hope you have a Happy April Fool’s Day! Not sure if you should be pranking your co-workers or not? The bonus chart below will help you decide! Ha this seems pretty spot on! « You Will Never Believe What is Used to Tie-Dye These Easter Eggs!